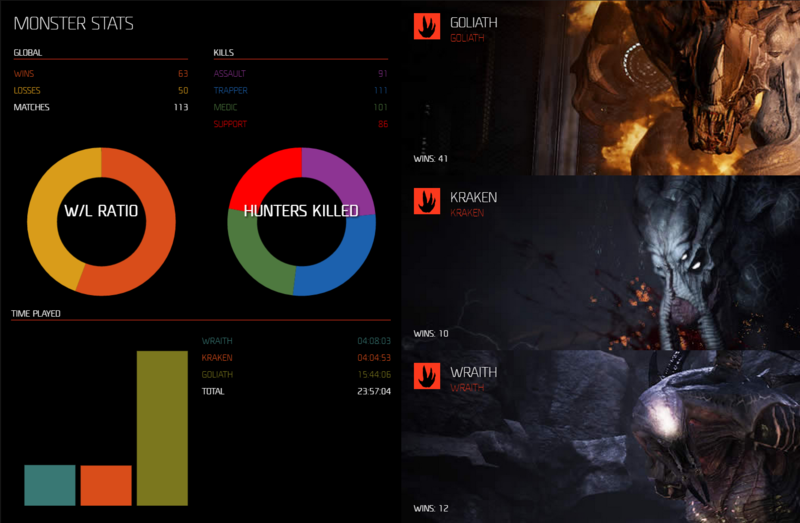 These are my personal monster stats. It’s from the gamechanger which looks to be a work in progress. Someone else found it but I figure people may want to see exactly what it can do. Be aware that much of the website is unfinished and looks like we aren’t even supposed to have access to it. Also, trapper is blue. My brain hurts. The hunter version of this page is broken completely. The gamechanger also has maps, modes, wildlife, and other cool info, but remember, this is in no way finished. Yeah, the color coding is off. Why not just have Assault red, Support yellow, Trapper green and Medic blue? YOu could change wins and losses to purple and white or something. As I said, it’s all fucky. But still cool to see. I do not know these magic things. I find pretty pictures. I think it’s the ranking stuff, so online games, I know because I remember well my kraken victories. Regarding color correspondence, maybe the hunter colors weren’t contrasting enough from a design standpoint so they didn’t use them. I guess it would help. The page seems pretty much finished except for the leaderboards part, we’ll see how they implement that. Mine says I have only 5 hours on trapper despite it being my most played. Everything else is placed around 10-15. It’s weird. Here’s the original post I made, really is an awesome site that TRS should advertise more. Yeah! I saw that, it was nice from you sharing it! I think I had stumbled into it before, as the address was already in my browser history, but clearly I didn’t know what to make of it. My guess is that they’re going to wait for the leaderboards to be finished to launch it, either that or another milestone like more monsters or the fabled 4th tier. It’s useful for now at least for a quick check of wins without logging into the game. I loved the map section, as I commented in the original thread, I was delighted to finally fin the source of clean map images I plan on downloading them all! Thanks for finding it, I couldn’t find your post so I just shared a quick visual part in a new post. I gotcha! Peculiar that TRS has yet to truly advertise it but as it still seems to be a work in progress it’s likely we’ll see an official announce at some point.